This weekend was spent both working on my own blackwork and trying to design some for Beth. Graphic design hubby was of great help on the adobe graphy program he had, since its much easier to erase on that than it is on graph paper with a crappy pencil eraser (pencils can be hard to come by in this house). It also makes for a much nicer picture on my blog. teehee. The following designs are all Beth possibilities. I took the idea of the pomegranates that she seemed to favor, then did one pomegranate design and then totally disregarded pomegranites to persue what I'm calling the flaming onion. Actually, it was supposed to be some sort of artichoke pomegranite hybrid, so it can also be called the artigranite, the pomechoke, and hubby calls it a flaming pineapple. Its clearly got identity issues... Speaking of which,Beth-- please lemme know if you'd rather purity in your pomegranates, rather than mutants thereof. I'm a radiation biologist and have a little thing for mutation. Anyway, Beth, please look these over, decide if you like any of them, or elements thereof, would like me to tweak, or like me to try again ;-) I will not tell you which one I like best, but I can tell you that I am not 100% happy with any yet. Therefore, if you are not super fond of any, believe me, I understand and will go back the drawing board, or graph paper, or adobe or whatnot. Also, when we do come up with a wristy cuff you like I can work up a neckline deal using similar themes. I figure that'll save designing necklines for all these possibilities until we actually find one you'd like to work with. hrm...I suppose I'll tell my inspirations. The twisty bit/frame on the two outer designs are from Dragonbear's Italian sampler, though it appeared there with acorns, and we modified it a bit. 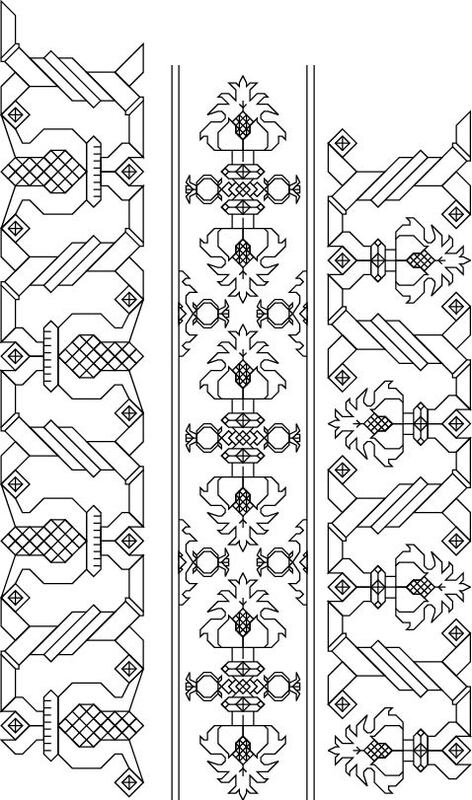 The pomegranite in the left most design is a not quite as stylish version of one found on Kateryn de Develyn's spanish sampler (its black on the sampler). I tried to do the super stylish one in this design, but it didn't fit well in the twisty background. Actually, I wouldn't mind using this pomegranite design plugged into something else, as I think its loverly. If you move your eyes to the right of that spanish sampler by kateryn, you find my inspiration for flaming onions in green. The middle design combines flaming onions and an alternative pomegranite as seen on Blackwork archives. The left is obviously same background as first, but uses flaming onions instead of pomegranites. The thing I like about the flaming onion is the shape kinda mimics some of the Italian fabric prints. Oy! Those are all great designs! I'm a fan of the flaming onions. And a fan of mutants. I think that perhaps the center one speaks to me the most. I like the balance of the big flaming onions and the wee little artigranites or whatever they are! Also, I just like saying "flaming onion." Oops, said it again. Yes, I think I favor the center one. Despite how long I think that is going to take to implement! So tell me, it's 2 inches on what stitch-per-inch scale? 10-ct aida? 14-ct aida? Just curious. Whatever it is, I'll work with it. I will have to check the scale. I think the graph paper we used was 10 squares per inch, but it could've been 20. I had a little brainstorm for the center one that I may try out to see if i can alter it. I will show you both to compare. If you'd like to see flaming onions in any other incarnations, please lemme know. As I'm not in love with any of these designs I start to think others might not be either. ;-) And mostly I just want you to love it. I love that blackwork! Would you mind if I used it on a dress? I will happily give you credit for the design in any blogging/Featured Attyre shots. 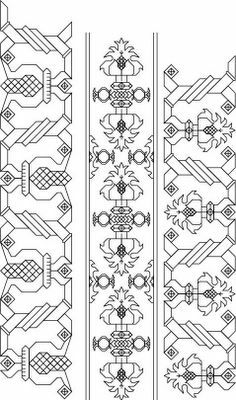 I need some embroidery for an Elizabethan I am planning and this looks totally yumalicious!